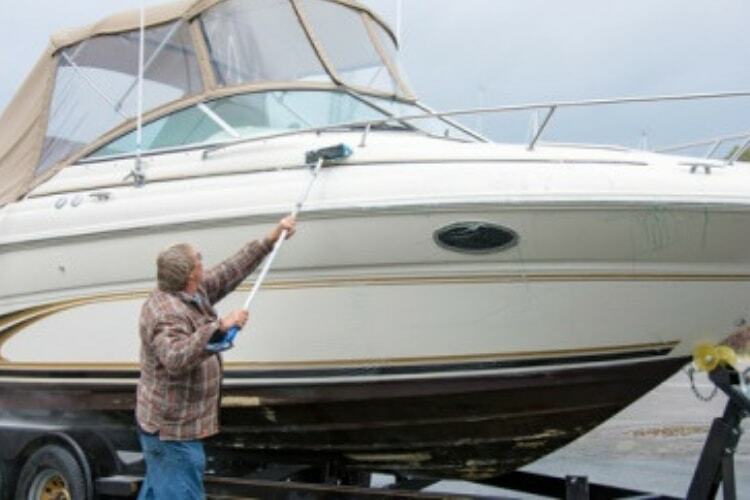 Boat Maintenance – A Year-Round Guide | Gold Eagle Co.
Like a car or any other vehicle, boats need specific care related to the weather during each season of the year. This ensures that the vessel will be protected against the elements and ready to go when it hits the water without any problems. The amount of use the vessel gets during each season will affect the type of boat maintenance required, as in most places boats remain in storage on land during the cold months and are used much more consistently during warm weather. A double check for openings and cracks in the structure is always a good idea. The battery should now be charged to full strength and the terminals should be free of rust or corrosion, which will create a good connection. Any items like life vests, fire extinguishers, and electronics should be returned to their spaces in the boat and checked to make sure they work or be replaced if necessary. Spark plugs and the propellant system should both be checked or fixed if needed before operation. The boat will need to be transported to the water, so look at the hitching system and tires to make sure there is a secure connection before hitting the road. Regulations regarding insurance or other local laws should be researched and made compliant for your own safety and protection at this time as well. While the boat is going to get the most use in the summer, there are a number of things that should consistently be checked. All lighting, electrical, and communication systems should be functioning to prevent emergencies at sea or call for help if needed. Rinsing, washing, and waxing are all important methods of boat cleaning for both the interior and exterior while it is docked. The propeller needs to also be checked before or after any trips, as even minor damage affects the drive train. After the summer, resources for boaters become less common as everything winds down for the year. Docks that are open for fueling may close, so it is important to make sure you have enough fuel before fall begins. Radios or communications systems become more important during fall boat trips, as there tends to be less law enforcement or other boats around to help. Having enough clothing on the boat in the Fall months is also important as temperatures can drop and storms approach quickly when in the middle of a lake or the ocean. When the winter season comes, it creates a number of special requirements due to the cold and the fact that most boats are sitting in a storage space or garage. An engine gets a lot of debris in it from the water during yearly operation. Each engine has an opening that can be used to intake clean water through the entire apparatus and flush out everything inside. This process of flushing out the whole engine ensures that nothing will sit inside the engine parts for several months and cause wear or damage. Antifreeze and fuel stabilizers should also be added to the appropriate parts of the boat to prevent problems caused by cold weather and stagnant gasoline. The battery should also be removed and charged to preserve its life. Another good idea is to check the hull and exterior for cracks and other areas that may need to be plugged or painted while the boat is dry and has plenty of time to rest.